LG has a large share of Bluetooth headsets with some amazing features. LG Tone Platinum headphone is just an addition to the amazing series it offers. It is one of the most premium and most popular Bluetooth headphones by LG. What catches the eyes is its sleek and slim design. It is so light in weight that you would love to carry it along with you. The concept of round the neckband is not so popular yet. But, LG Tone Platinum headphone has set the tone for such headphones. The headphone has power buttons and the Bluetooth connectivity is just mind-blowing. The smooth Contoured Design of this headphone is simply eye-catching. It supports various types of sounds and with HIFI tone. The headphone has a very balanced base and that sets it apart from other Bluetooth headphones that are available in this price range. You can expect a refined sound with bass and exceptional music quality with LG Tone Platinum headphone. As it offers advanced noise cancellation, you can just enjoy your music on the go. With this feature, it guarantees that you won’t really hear the external sounds even if you are in a noisy environment. It’s a stylish looking headphone with some amazing features. If you are a music lover, then you should own this good-looking headphone. The sound quality is great and the battery life is also good. The battery life can last up to 10 hours without charging. So, you can hear your playlist nonstop without any problem. LG Tone Platinum headphone is also good for gaming purpose but not for heavy gaming needs. If you are a frequent traveler, then this headphone is good for your needs. As it features the active noise-canceling feature, it totally blocks the noise around. It’s great if you are traveling on an airplane or for that matter train also. The feature is also good for people who make frequent voice calls. The noise-canceling feature can cut the noise for incoming and outgoing calls giving you hundred percent clarity in voice. Irrespective of your environment, you can make and receive calls without any problem. LG Tone Platinum headphone is specially designed for music lovers and professionals. You won’t be disappointed with the sound because its frequency and Bluetooth connectivity are pretty good. Is this headphone good enough for mixing music? Well, the answer is not really. You can get better professional headsets for mixing music and other professional needs. There are many great features of LG Tone Platinum headphone; let us look at some of the key features. LG Tone Platinum headphone has a Slim & Ergonomic Design and it looks stylish and elegant. Its one of a kind design sets it class apart from other headphones in this range. The headphone is available with the anodized brushed aluminum alloy trim and that makes the headphone light in weight. Unlike other Bluetooth headphones that are bulky, this one is quite lightweight and easy to carry. The headphone offers hi-fi surround system and that makes it perfect to hear any stereo sound. From music to games, every sound is crystal clear with this feature. The headphone is paired with the LG G5. Also enabled with the revolutionary Qualcomm® apt-X™ HD codec, it simply lets you bask in the sheer power of a 24-bit audiophile experience and that too in complete wireless control. Wireless connectivity is the highlight of this headphone. LG Tone Platinum headphone offers a talk time of up to 11 hours and that only means that you can talk for hours without any disturbance. It also offers a music play time of 10 hours without charging the battery. This is great if you want to hear your music on the go. The headphone comes with a Balanced Armature Speaker Unit. You can hear your music clearly with the speaker support. This is the best feature that LG is offering with this classy and stylish headphone. The headphone is available with Dual MEMS Microphones, which means there is no issue of connectivity and comfort. Though, comfort depends on the person using it in this case. Another highlight of LG Tone Platinum headphone is its charging time. It takes only less than 2 hours to charge. So, if you need to use your headphones in a hurry, you can charge it quickly. LG Tone Platinum headphone has Bluetooth 4.1 version and it’s good for connectivity. The headphone offers an active support for all the apple and android devices. It has Audio Speaker Optimization Technology and that makes it more popular. The headphone has an even, rubbery exterior. It is very easy to put on thanks to a bendable axis at the back of the halo and that makes it too comfortable. The flexible earpiece zip in and out of the band and thus operating becomes quite simple. The headphone is around the neckband and therefore its delicate. You cannot simply use the headphone for your rough use. Fit wise the headphone is average, you won’t feel the pressure while wearing it for long hours. But, it might hurt if you use it at a stretch. It’s perfect for every head type, even for the big head. The headphone has an active noise cancellation feature that blocks the outer sound. The advanced active noise cancellation feature not only reduces the unwanted sounds around you but makes it possible to listen the audio in a clear way. It does not raise the volume too, so you can be sure of the sounds and voices that you hear. It works perfectly while traveling too as it cuts the travel sound. The feature is also handy for all the incoming calls. You can talk to anyone with a great clarity because of this feature. It’s an added advantage of the product. LG Tone Platinum headphone has a great build with stylish design. The looks are indeed attractive with the matte black finish and glossy plastic. There are sliders and buttons in the control on the side. You can use the feature depending on your need. On the left side of the headphone, you have a multifunction button that lets you activity voice command and answer your calls. The volume slider also lets you check the battery of the headphone. There are playback control buttons too that get activated with one click. Its functionality is quite good as compared to other LG models. Though Bluetooth is not the only way to enjoy music still this does a decent job in sound clarity. The bass in the Platinum base is rich but not too defined so this breaks the sound at times. The midrange sound performance of the headphone is quite good as compared to lower and upper-frequency range. The mid-performance sound is clear and crisp. The upper frequency can break at times. But LG Tone Platinum headphone has noise canceling feature that takes care of the noise coming from outside. Needless to say, you can enjoy a great music with this headphone. The battery performance of the headphone is quite average. It’s not too great and not too dull. It offers 11 hours of talk time once you fully recharge the battery. It offers up to 10 hours of music playback time that is good enough if you want to listen to your playlist at a stretch. The best part about LG Tone Platinum headphones is the charging time it takes. If you want to charge the battery quickly, then all it takes is just two hours. You can completely charge the battery in two hours, so that saves a lot of time. It can pose a problem in fit. If you are looking for a sleek headphone, then this is not a bad choice. Though, you won’t really get out of the world experience performance with this headphone. Still, its stylish looks make up for it. The headphones are not that great for your professional needs. Though the headphone is comfortable, you can use it for music tracking and other studio needs. The headphone is good if you simply want to hear your music. It is also good if you are looking for a decent headphone with active noise canceling feature. This works well for noise canceling as it blocks the sounds in a great way. Tone series headphones by LG have been good in the past as well. You can try this if you are looking for a budget headphone. 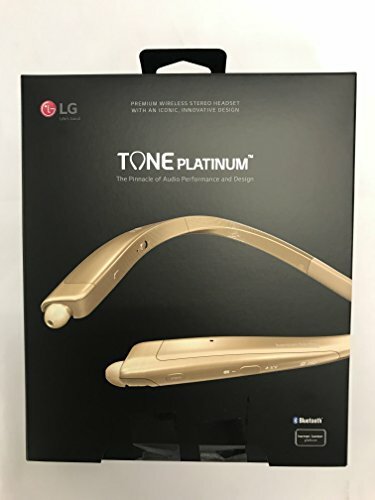 Though LG Tone Platinum headphone gives you your value for money but is certainly not the best in class as far as its performance is concerned. You can check for other better alternatives as well.